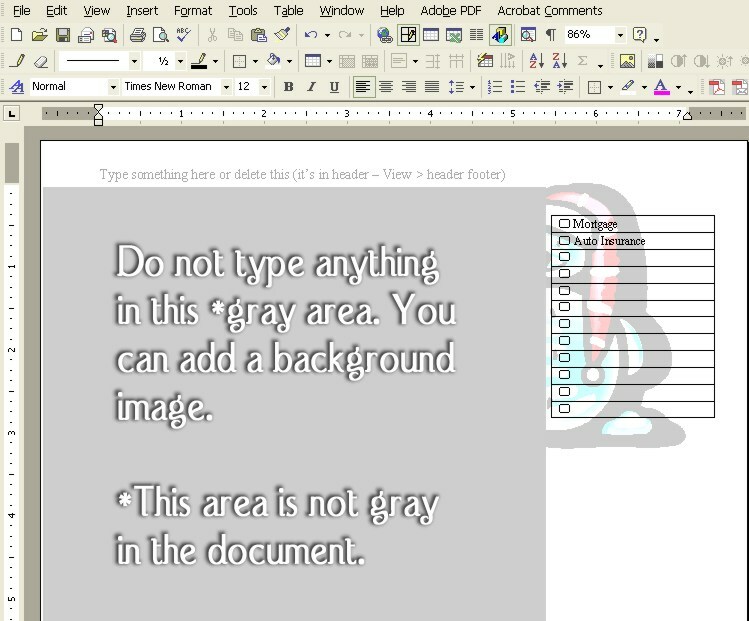 This page tells how to change a header in Microsoft Word. Use this information to change the header in the block template to add a header to page two of the sans-list block calendar. 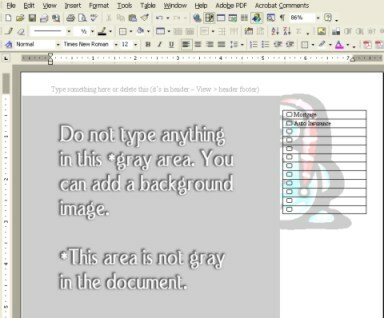 The image shown here highlights where you should not type. Note that an image can go anywhere as long as it is faded. Click on the image to see a larger version. With the Sans-List Template open, follow the instructions below. Tip: Print a test copy on page two of the sans-list calendar before making changes. Do this to make sure the table is the proper width and the header is placed at a height that does not interfere with the calendar. Print using the lowest quality draft. How to open the header to change it. "Type something here or delete this (it's in the header - View > Header and Footer"
With the header open, make changes, type something that you want to see every time you open your planner. There is a limit of one line. If you type something that is long, it will spill out over your calendar days and blocks. Try to put it all on one line. Close the header when you are finished. To close it, either choose the close button if it is on your toolbar or repeat the steps explained above to open the header.